For Turkey Patties, Combine in a processor mushrooms, 1/2 cup cilantro, 3/4 cup onion and garlic. Processor until finely chopped. Transfer to a bowl. Add ground turkey, salt and pepper; mix with hands until combined. Shape into 4 burger patties. Grill or pan fry burger patties, flipping a few times. For Avocado Mix , In a small bowl, mash the avocado with a fork. Add chopped red onion, 1 Tbsp min. . .
1For Turkey Patties, Combine in a processor mushrooms, 1/2 cup cilantro, 3/4 cup onion and garlic. Processor until finely chopped. Transfer to a bowl. 2Add ground turkey, salt and pepper; mix with hands until combined. 3Shape into 4 burger patties. 4Grill or pan fry burger patties, flipping a few times. 5For Avocado Mix , In a small bowl, mash the avocado with a fork. 6Add chopped red onion, 1 Tbsp minced cilantro, lime juice and salt. Mix well. 8Toast hamburger buns. Top with grilled turkey burger. 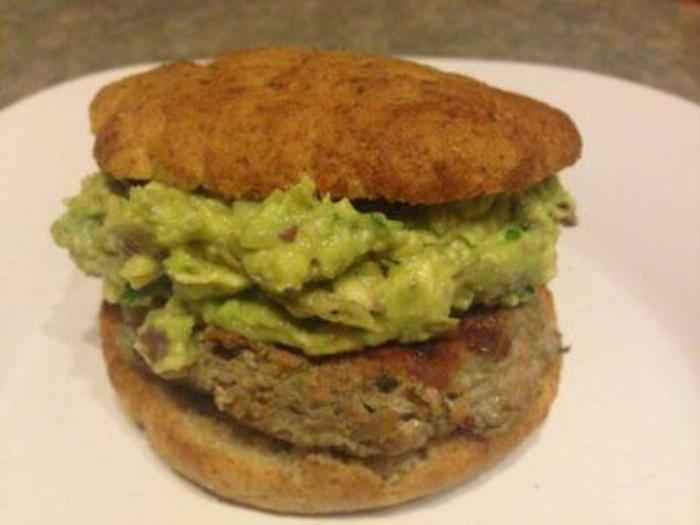 9Spread 1/4 servings (4 servings total) avocado mixture over each burger. 10Top with remaining toasted hamburger bun.